Choosing the best pool heater for your in-ground or above ground pool can be tricky, but it’s worth it once you find the right one. Pool heaters help you extend the swimming season in your pool, so you can enjoy a dip even in the spring or autumn months. If you have a spa or hot tub, getting the right heater is essential for warming up the spa quickly and keeping it hot for you to use anytime. What Type of Pool Heater Do You Need? 1 What Type of Pool Heater Do You Need? 6 Gas Heaters Versus Electric Heat Pumps: Which Do You Need? This type works by absorbing energy from the sun into solar panels and transferring it as heat into the pool. They work slowly and cost the most of any of the pool heaters to install, but there are NO monthly operating costs, little to no maintenance needed, and they are very environmentally friendly. 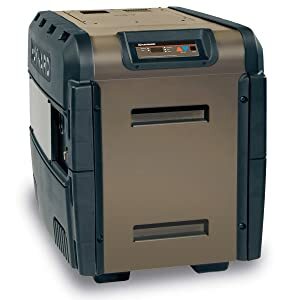 Working off of your electrical connection, these pool heaters can provide consistent heat throughout the year. Electric heaters work the fastest of all the heater types, but they can also be quite expensive to run each month depending on the type you choose. They are not energy efficient at all. Heat pumps also work using your electricity, but they use the heat from the air or water itself to heat your pool rather than pure electrical power. This makes them less costly to operate each month, although they do work more slowly than traditional electric heaters. 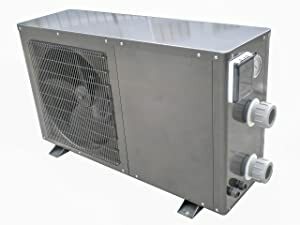 You can count on a heat pump lasting for a long time, sometimes even 15-20 years, and costing a moderate price each month, although they are also not at all energy efficient. Using gas to heat your pool is not as popular as it used to be, because of rising gas prices over the years. This is actually the most expensive method each month, even though the heater itself is usually the cheapest type. This isn’t a true heating system for your entire pool, as it’s a simple solar mat for an above ground pool only. The Intex heater mat is able to increase the temperature by a few degrees on a sunny way, so it’s not a bad idea for late spring or early autumn. This is only effective for small above ground pools up to 8000 gallons and 11sq ft. in size. 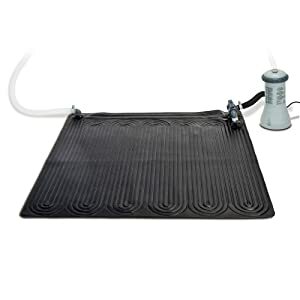 As a solar heating mat, this device doesn’t use a lot of energy and it can save you some money during the swimming season if you normally use a more energy-consuming device. It’s about 47 inches on all sides, but shrinks a little when water is running through it. You can choose to open or close the bypass tube depending on how much water you want to let through at once. For larger above ground pools and a more effective heating system, the Bear Solar heating system is a good choice. These solar heating panels can be propped against the side of your pool, placed on the ground or the roof, or hung around the area. Your normal pool pump will push cool water through the system and hot water will be returned out from the other side, into the pool. It is able to increase the temperature of the water by around 10 degrees during sunny days. For each panel you buy, 80,000 BTUs are produced for the pool, so you can customize based on your pool’s needs. These solar heating panels are a good value for your money, as they are lower priced than many of the permanent solar panel installations. Heat from the sun is absorbed by the panels and transferred to the water through piping that surrounds the panels. The Smartpool panels are great for roof installations or installation on a flat space near to your pool. To use this system, you need to hook up your pump to the panels to pass water through the piping and back into your pool. It will usually heat up the water well during hot days, depending somewhat on the area you live in. This is a 92,000 BTU electric water heater for your in-ground pool. It’s rated as a good fit for pools up to about 15,000 gallons, regardless of depth or surface area. 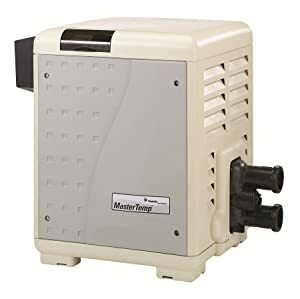 You can expect between 5 and 10 degrees of warmth during most seasons when you’re using this pump, if you use it for the properly sized pool. Set your desired temperature on the digital display and leave it to do its work. This pump can replace your existing booster pump or heat pump if you would like an alternative to either of these. It’s also compatible with the Ecosmart Remote Control for heaters. This HeatPro heat pump is a high quality choice to get your pool warmer. It’s made from ultra-gold corrosion resistant titanium, so it does not rust from water exposure. An acoustic compressor and specialty fan blade make this heat pump very quiet when it’s in use. As an air-operated heat pump, this unit can sometimes make a bit of noise. You can get this heater in a variety of sizes from 95,000 BTU to 140,000 BTU. The larger and smaller heaters differ in shape and appearance, but they are all made from the same high quality materials to last you for years. Meant for smaller pools or spas, this heat pump is a good choice for pools in warm environments. It can bring up the temperature of the pool and help maintain a more comfortable temperature for swimming and relaxing. The design helps protect the pump itself from overheating and becoming damaged, so it will shut off if the pump starts to get too hot. Another way this heater protects itself is by shutting off if there’s no water going through it. This will help it stay the right temperature and not cause damage to itself. 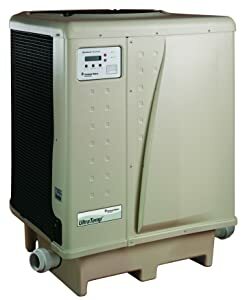 Made from a galvanized steel case, this is asturdy and dependable heat pump. Made with corrosion-resistant titanium heat exchanges, this heat pump can last for years without problems. It has an LCD screen to display temperature information and allow you to control the settings easily. It uses smart self-diagnosing technology to stay at its best and monitor the system to issues as they happen. With its slim footprint and efficient 55,000 BTU operation, this is a good choice for smaller pools and above ground pool setups. It’s certified to operate at around 25 cents per hour, which is a highly efficient system compared to many other options. The heat exchanger is made from 100% titanium to help prevent issues with corrosion and damage by pool water. You can control everything on a simple digital display with controls. This Hayward natural gas pool heater comes in a lot of different sizes for a variety of in-ground pools. You can get it between 150,000 BTUs and 500,000 BTUs depending on how large your pool is and the surface area. The design for this heater uses gas responsibly and creates very low emissions that meet standards in many low NOx regions. This gas unit is designed to be efficient and reliable, with polymer headers and nickel heat exchangers for durability and long-lasting value. 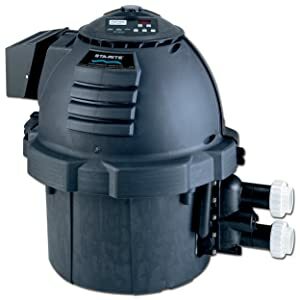 You can get this Pentair in a range of BTUs, depending on the size of your pool. There are 8 different models of the same unit, ranging from 175,000 BTUs to 400,000 BTUs. Some of the models feature extra protection and features, giving you more options for a longer-lasting heater. This includes the heavy duty and ASME models. The exterior is made of rust-proof materials, so you won’t have to worry about it getting ruined near the pool. It is also certified for low Nitrogen Oxide emissions, making it a good option for those who want less of a carbon footprint. Available only as a 400,000 BTU heater, this pool heater runs on natural gas. It’s a great choice for keeping hot tubs toasty and home swimming pools comfortable for fun. This heater is made a little lighter than many others, and has a smaller footprint, making installations easier in most homes. With 83% thermal efficiency and low NOx emissions, this surpasses the DOE standards for energy efficiency. Overall, it’s a conveniently sized pool heater for personal installations, especially larger pools and hot tubs. Similar to the Hayward H-Series I talked about above, this unit runs on propane gas rather than natural gas. It is available in 6 BTU sizes, from 150,000 to 400,000. This is an environmentally friendly propane option that meets the standards for low emissions around the US. The high quality materials used to make this gas pool heater are rust resistant and durable, making it a great option if you need a long-lasting pool heater. A Cupro nickel heat exchanger helps to keep the unit in great working order, no matter the water conditions of your pool at any given time. This high performance propane gas pool heater is capable of heating medium to large pools in most locations. It will quickly heat up your pool and bring it to your desired temperature. 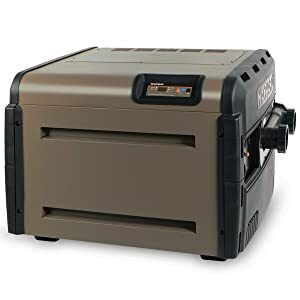 This is an energy efficient machine that is also certified for low NOx emissions, making it more environmentally friendly than some other propane gas pool heaters. As a 400,000 BTU size heater, this is not a good choice for small pools, but it’s great for medium or large in-ground pools and spas. It’s a relatively compact heater made from high quality, rust-free materials. Unit gets quite hot when it’s operating – don’t touch! This Sta-Rite heater can be a great option for a gas pool heater that’s a bit more visually appealing and compact, yet still durable and effective. All of the components reside within a rustproof housing made of Dura-Glass, a rust-proof and weather-resistant material that will keep your device running well for years. It is also a lightweight design that’s easy to fit in smaller spaces around your pool area. It operates efficiently with an 84% efficiency rating, one of the highest for this type of gas pool heater. Cupro nickel heat exchangers make this unit fully-fitted to work in any pool conditions. You will size your pool heater in a unit called BTUs (British Thermal Units). The number of BTUs you need is related to the surface area of your pool and how many gallons of water are in the pool, because these are the factors to consider when you’re heating a pool. The more BTUs, the faster your pool will be heated, and the more power necessary to use the heater. How quickly do you want the pool heated? Some heaters work more quickly than others. Standard electric heaters are the quickest, while solar heaters are usually the slowest. There can be major price differences between the various types of pool heaters. Gas heaters may cost as little as $1500, while solar panels can be $4000+. Beyond the sticker price, you should consider the installation costs for different types of pool heaters as well as the monthly cost to operate the pump. The best solar pool heater will not cost anything per month and won’t need maintenance, while the best gas pool heater will cost up to $500 or more for gas every month and may need regular maintenance. Consider these hidden costs before you make your final decision. As I mentioned, the size of the pool can greatly impact your decision about the best pool heater for your needs. Large pools will take a long time to heat with some types of heaters, and may take a more reasonable amount of time with other types. Differently shaped pools can affect the type of heater that will be best for you pool, as some are more effective in odd pools than others. One question you should ask yourself is if you really need a pool heater at all. If you’re living in an area that’s warm most of the year, it might be a waste of your money. However, if your pool is frequently quite cold and you want to use it more often or enjoy it more, a heater is a good decision. Also, if you own a hot tub or spa than a heater is a necessity. What weather conditions does your pool encounter on a daily basis? Is it windy, dry, rainy, hot, cold, or otherwise? This can change which heaters will be the best for you. For example, in an area where it rains a lot or is cloudy frequently, solar heaters are a bad choice because they can only operate when the sun is shining. Is your pool in-ground or above ground? Your heating needs will differ a lot based on this question. Getting an above ground pool heater is not the same as getting an in-ground pool heater. 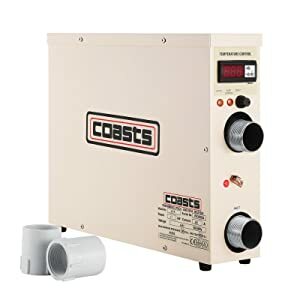 The best in-ground pool heaters may not work well for above ground pools, due to size differences and connection ports to the pool itself. Choose wisely based on your own research. There is a lot that goes into correctly sizing your pool heater. You’ll need to know details about your pool, such as the volume of water it holds and the performance you expect from your heater. There is a little bit of simple math required to get the right measurements for your pool heater. The final measurement will be given in the form of BTUs, a term that is used to measure the amount of energy used to heat up 1lb. of water by 1 degree. You’ll find BTU ratings on all pool heaters. 1 gallon of water is equal to 8.83 lbs. The next calculation will be based on the current temperature of the pool water versus the temperature you want the water to be. For this example, our 10,000 gallon pool is 70 degrees now, but we want it to be 80 degrees. Those two calculations help you find out how many BTUs are needed to get to the right temperature, but you also need to know how many BTUs are needed to maintain the right temperature. This is calculated based on the surface area of the pool. For our example, our 10,000 gallon pool is a 15×20. This final BTU measurement is the most useful to help you pick out the best heater for your pool. Recognize that if you want to use your pool is colder weather than your calculations, you will need to oversize the heater past the calculated 60,000 BTUs. It’s best to oversize by 20 – 25% when possible, to account for more extreme conditions and efficiency loss over time. This brings our example pool’s ideal BTUs to 75,000. The best practice is to get the heater which is one size over what you need. Doing this will help the heater function more efficiently and save the parts from quick wear and tear. Don’t get less than the BTUs needed for your pool. Keep in mind that our example pool is much smaller than a normal household pool, so your new pool will likely need more BTUs than this example. Unbalanced chemicals can cause corrosion to happen more quickly than it should. It’s also unhealthy for you to swim in a pool with unbalanced chemicals, because it may cause sickness or skin damage. Your heater is not immune to damage from pool chemicals. 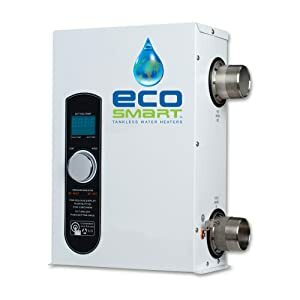 While they’re designed to handle normal saltwater, chlorine, or other chemical water conditions for years at a time, an imbalance of any of these chemicals is likely to speed up the deterioration and cause failure. Short-term exposure to very imbalanced chemicals can rapidly damage your pool heater while long-term exposure to slightly imbalanced chemicals will cause accelerated deterioration and shorten the heater’s expected lifespan. The most important things to remember for your water is that the pH should be between 7.2 – 7.8, chlorine levels are not meant to exceed 10ppm, and calcium hardness levels need to stay below 400ppm. These are not the only factors but are generally considered to be the most important factors to a good chemical balance in your pool. If the heater isn’t installed in the right order or anything is messed up during installation, it can cause failure more quickly. One note is that if you have a saltwater pool, the saltwater generator needs to be installed after your pool heater. The problem with improper installation is that it can cause failure very quickly, sometimes as soon as 6 months after installation, and it may void your warranty. If you aren’t sure you can install the heater exactly right, it may be best to contact a professional to install it for you. This may save you a lot of money in the long run. Even if you do hire a professional, read up on proper installation and try to double-check his work to make sure it has been done right. Heater casings should be electrically bonded. This will help to prevent accidents resulting from electric shock, as well as keeping the heater safe from shorting out. Even if water does get in and ruin the heater, an electrically bonded heater case may keep it from damaging anything else in the pool or causing injuries. Backflow into a pool heater can cause it to be damaged, especially if it happens frequently. There should always be a valve installed between the chlorine generator and the pool heater itself. Other issues may exist with your pool heater, but these are the most common problems that happen. If your installation is good and you’re maintaining the system properly, you should be able to avoid these issues entirely. Gas Heaters Versus Electric Heat Pumps: Which Do You Need? Electric heat pumps and gas pool heaters are two of the best pool heaters, so it’s good to understand how they work and which one may be best for your pool. They are both great choices for the right circumstances. There is no best way to heat a pool, so you have to pay more attention to what your area is like and what you want to get out of your heater. Out of the two choices, heat pumps are best suited as maintenance heaters. They use the warm air outside and heat from direct sunlight to create warmer water in your pool. This is effective for warming up your pool during the normal swimming season when it’s already warm outside, but the water is colder than you want. Getting the best pool heat pump is fantastic for maintaining a good temperature range during warm conditions, but it can’t heat up a pool effectively during colder weather. If you’re looking to extend your swimming season or swim during colder weather, a gas pool heater is a better choice. These heaters are more effective because they use gas to directly create heat for the water. Gas heaters work regardless of the ambient temperature outside or the presence of the sun. Because of this, gas heaters are better if you want the heat your pool a lot warmer than the outside temperature. For a hot tub, you’ll want a gas heater, not a heat pump. Keep in mind that no matter which type of heater you get, it’s recommended you also buy a pool cover to conserve the heat in your pool overnight. 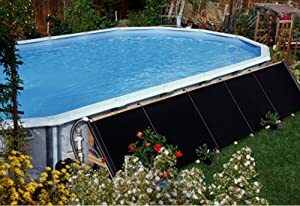 A pool solar blanket works best to keep heat from leaving the pool overnight. It’s estimated that a good solar pool cover can reduce overnight heat loss by as much as 90%! While it’s possible to install a pool heater by yourself, it might be very difficult to install certain types of heaters. It might be a good idea to hire someone for installations if you aren’t a handy person yourself, especially if you’re not very familiar with the type of heater and how it should work. Where can I get a pool heater? 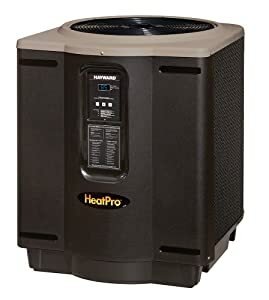 You can buy pool heaters in many different shops around the US, but it’s also possible to order them online from places like Amazon.com. This is a better idea for many people, as there is more variety to choose from and competitive pricing. Can solar heaters be used for anything else? 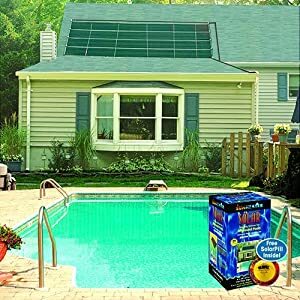 Solar panels for heating your pool cannot be used for anything else around the house. They are specially designed for heating larger quantities of water and cannot be used to power anything or to heat water in your home. How much do pool heaters cost? The cost of pool heaters can vary from as little as $1500 to more than $4000 depending on the type of heater you get and the size of the heater. Are pool heaters efficient or environmentally friendly? Most pool heaters are not particularly environmentally friendly, with the exception of solar powered heaters. The trade-off is that most efficient heaters are less environmentally friendly and vice versa. Each type of pool heater has a different level of noise. Most electric pool heaters make no noise at all, while some gas, solar, or heat pump heaters will make some level of noise. The type of pool heater you end up with will depend largely on what your pool is like and the specifics you need for your pool or house. 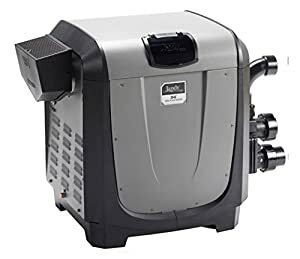 Whatever turns out to be the best pool heater for you may be different from what others are recommending, although a quality heater will usually work well for various pools. Bottom line is that you need to make your final choice based off of what your pool is like and what you actually need. Take the time to consider the points I’ve mentioned and see what exactly you need to meet your requirements.